In October 02008 Edward Burtynsky spoke for Long Now on The 10,000-year Gallery. Burtynsky, an internationally-recognized photographer, presented his ideas for a gallery of images to accompany the Clock of the Long Now. 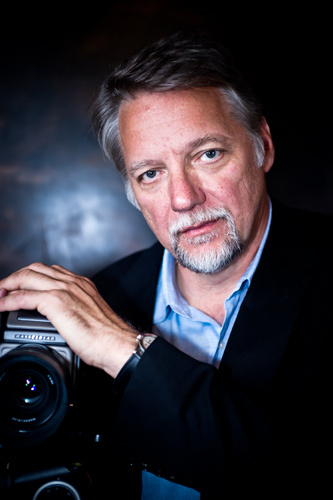 Watch video of Edward Burtynsky’s talk here. Long Now members: login to watch in HD. This is one of more than two hundred Long Now Seminar videos are free for everyone on our Seminar pages (in HD for Long Now members) or via podcast. Burtynsky’s The 10,000-year Gallery talk includes a formal proposal for a permanent art gallery in the chamber that encloses the 10,000-year Clock as well as the results of his research into methods of capturing images that might have the best chance to survive in the long-term. On the stage Burtynsky showed a large carbon transfer print of one of his ultra-high resolution photographs. The color and detail were perfect. Accelerated studies show that the print could hang in someone’s living room for 500 years and show no loss of quality. Kept in the Clock’s mountain in archival conditions it would remain unchanged for 10,000 years. He said that making one print takes five days of work, costs $2,000, and only ten artisans in the world have the skill, at locations in Toronto, Seattle, and Cornwall. Edward Burtynsky‘s photographs are collected in museums all over the world. He is known for his large-format photographs of industrial landscapes which include mining locations around the globe and the building of Three Gorges Dam in China. His work has been noted for beautiful images which are often at odds with their subject’s negative environmental impacts. In recent years his work has focused on water including oil spills around the world. His latest project is the film Anthropocene (02019). Long Now membership start at $8/month and includes HD video and many other benefits. Join Long Now today.